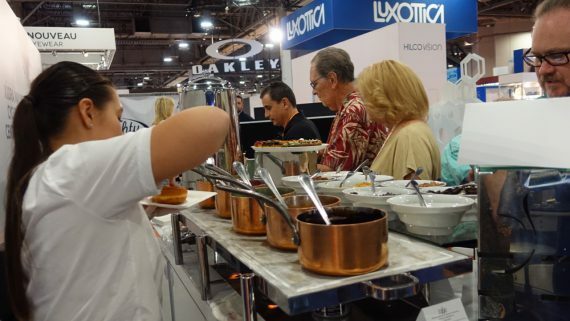 Thursday I took my camera to Vision Expo, a Reed Expositions trade show held at the Sands Expo & Convention Center September 27-29. This show, also known as Vision Expo West, was celebrating its 30th year and featured 6000 brands, 300 hours of education and even a mini-makeup makeover for eyeglass wearers. 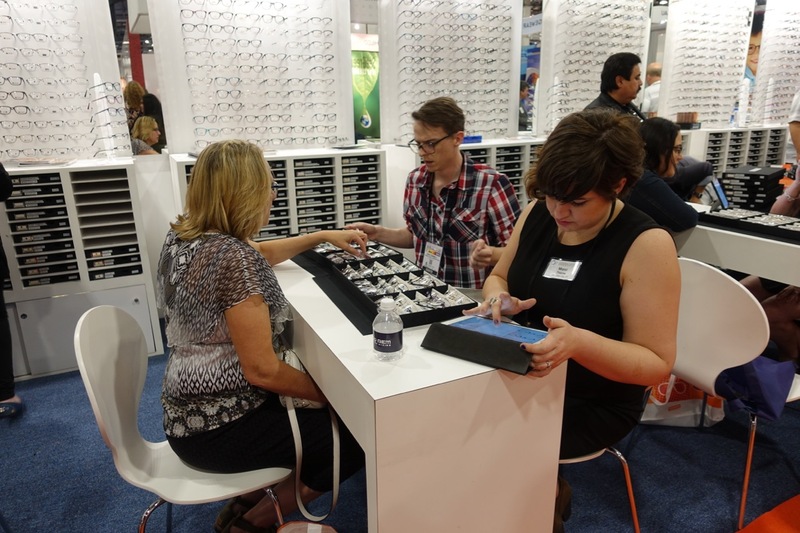 Expected attendance, among optometrists, opticians, lab personnel and sellers of eyeglass frames, was 23,000 people. 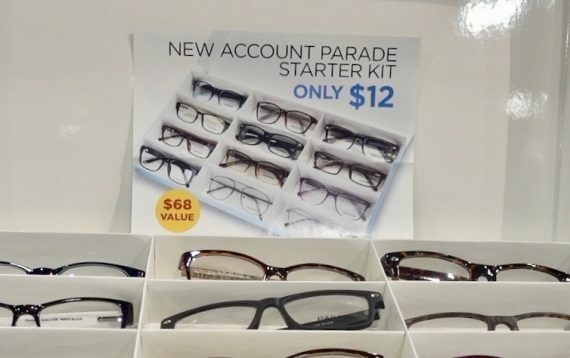 For folks like me who wear glasses and undergo periodic eye exams, this show is a WOW, but it is also quite technical so I avoid the displays of diagnostic equipment and big machines. 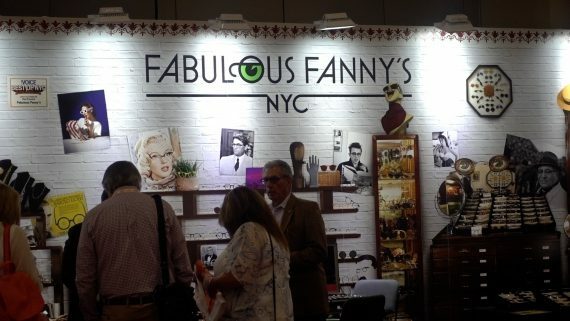 I’m a frame and accessories attendee as illustrated in the photos. Like most trade shows in Las Vegas, Vision Expo is a business-to-business show with customers selecting products to re-sell to their local customers. Big thick glasses used to be a sign of terrible eyesight, but the folks at MO eyewear call these thick frames modern design. 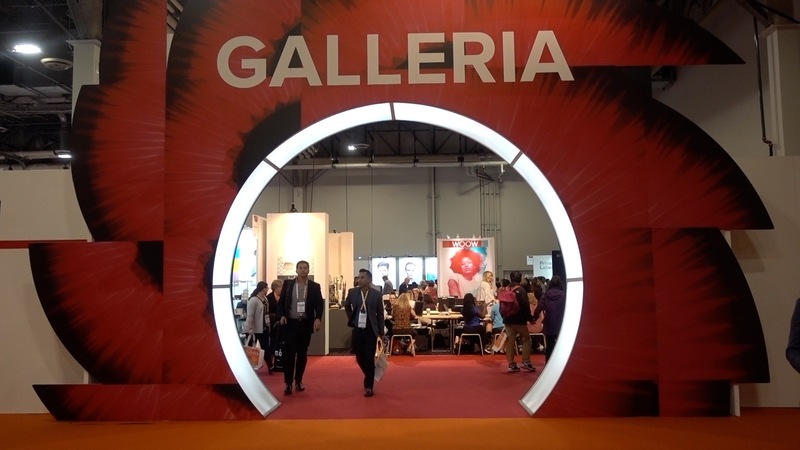 A large temporary entrance was constructed inside the show hall welcoming visitors to the Galleria of eyeglass frames. 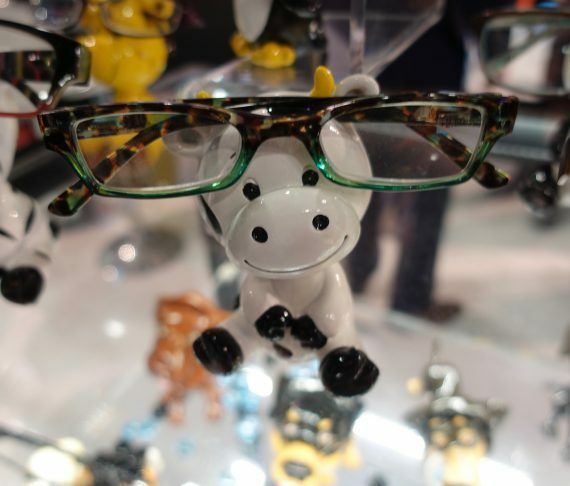 Ceramic animals by OptiSource will hold a new pair of eyeglasses and bring a smile as well. Retail cost: about $15. 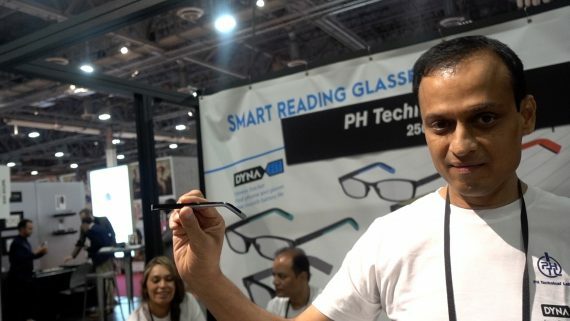 PH Technical Labs introduced two new features on eyeglasses of the future which they called “smart eyeglasses”. One innovation was for wearers of bi-focals who in the past have had to tilt their heads back to use the close-up lens when, for example, watching their computer screen. 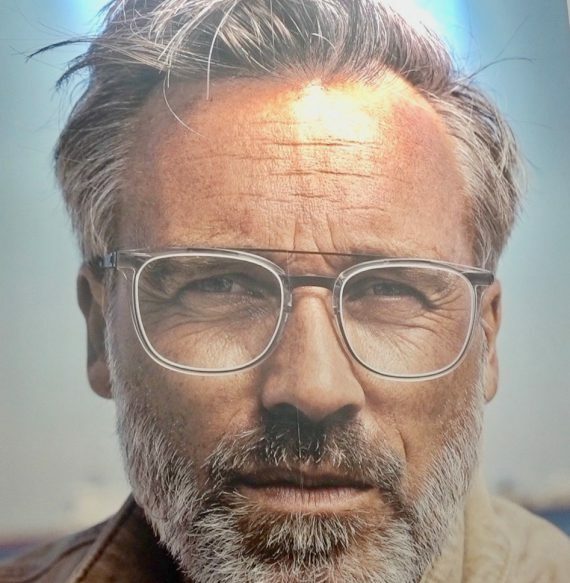 The new glasses actually sense the up-close event and automatically raise the eyeglasses up on the nose so that the wearer doesn’t have to tilt his or her head. 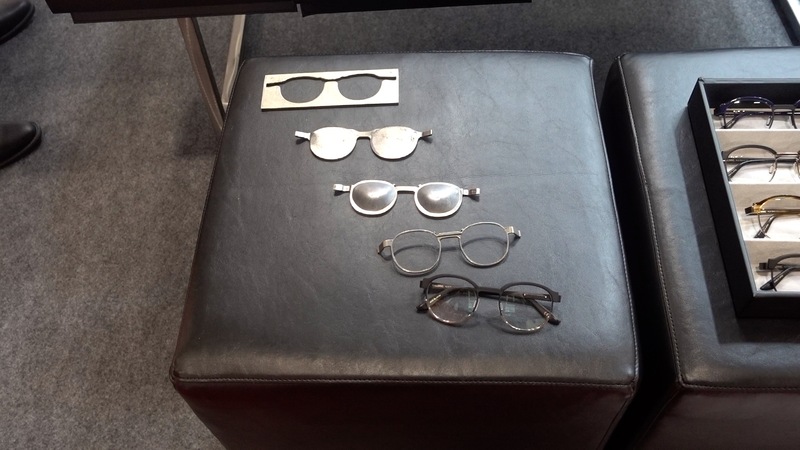 The other innovation was software in interchangeable sides of the glasses that allow for fitness tracking, playing of music and even accepting telephone calls. 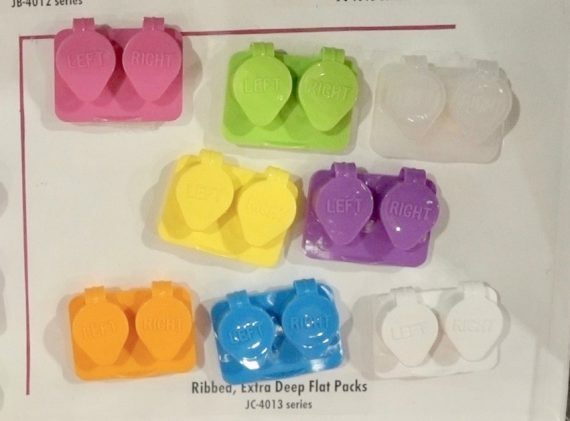 All the new features will be debuting next year. This product from GOOD-LITE is a Marsden Ball used in visual therapy. After a brain injury, for example, the injured person is taught to track letters as the ball swings in front of the patient. My favorite company name, Fabulous Fanny’s, NYC. 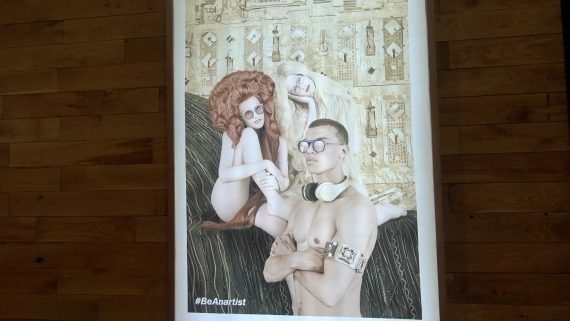 When I saw this poster, I wondered if anyone would be looking at the glasses these folks were wearing. Later I learned that this and many other posters are part of Etnia Barcelona culture. Etnia Barcelona says the company crafts its products through work “with the legends of the world of art and photography”. So yes this poster attracted my attention and that was the whole idea. 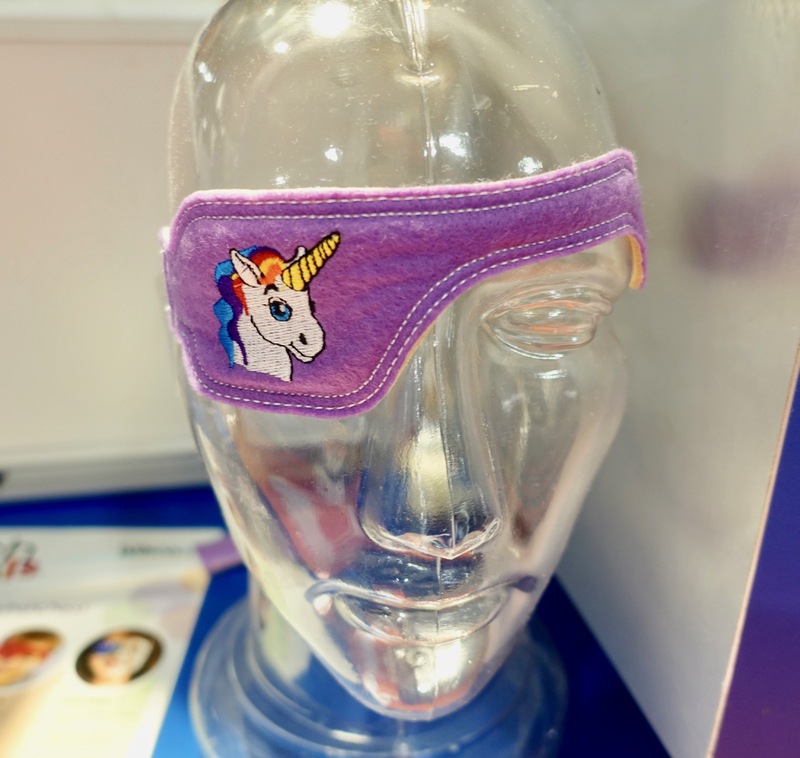 Yes, some young people wear eye patches, but why not have fun patches. This is one of the Wilson Ophthalamic’s collection of Patch Pals. 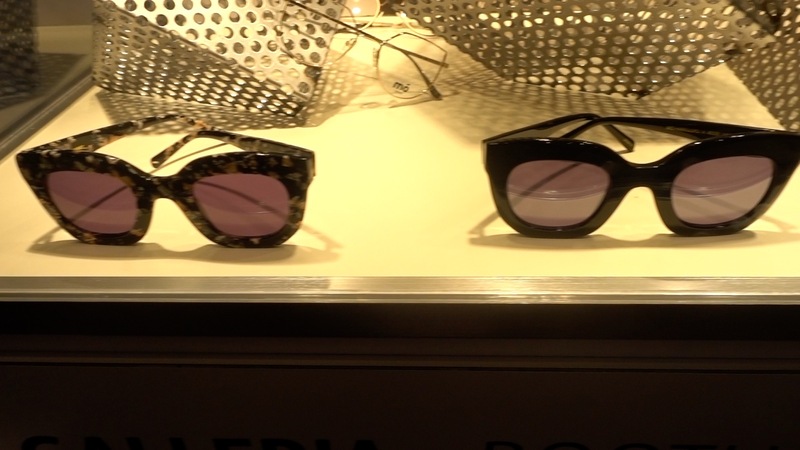 The production stages of hand-made Robert LaRoche sunglasses were on display at their booth. Below are LaRoche frames priced at retail about $500. 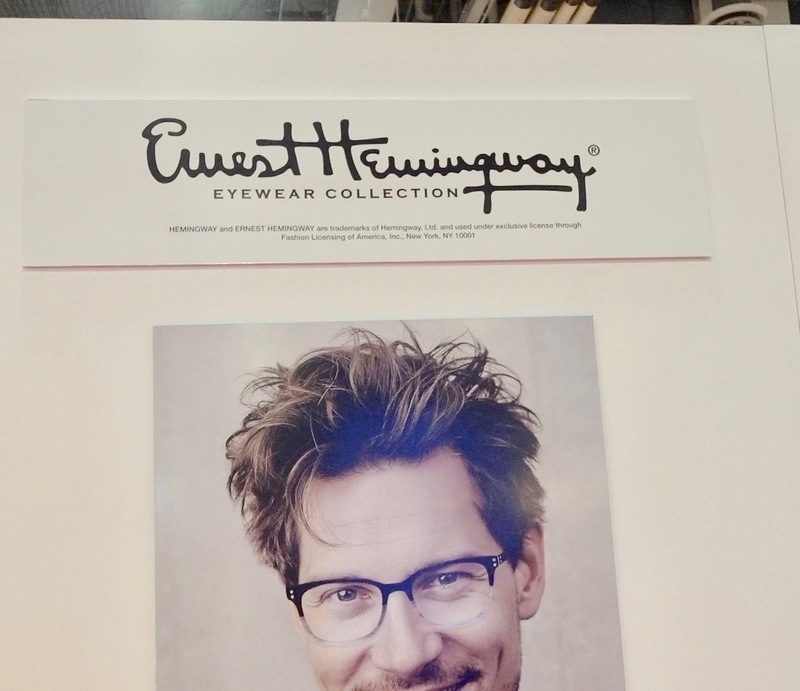 Branding is important in the eyewear business, but really…Ernest Hemingway frames? The man shot himself to death 57 years ago! 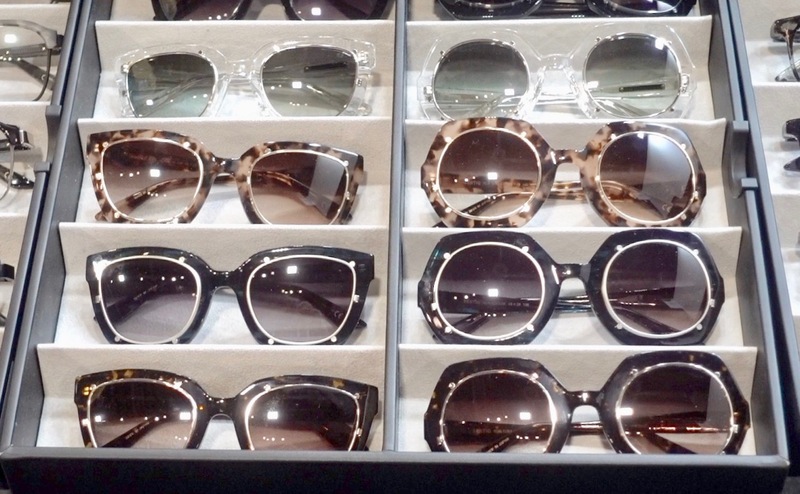 Some eyeglass frames are costly; some are not. This show special sold frames for just $1 each. 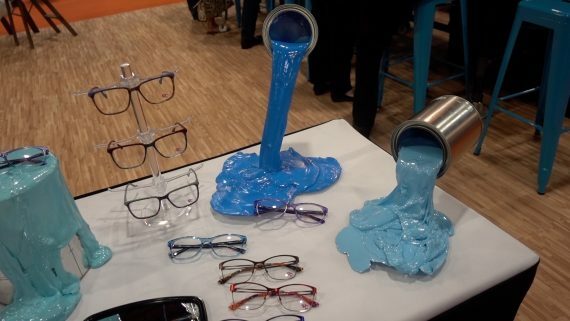 Free-standing paint-can sculptures at the Glen Lane booth attracted as much attention as the glasses. 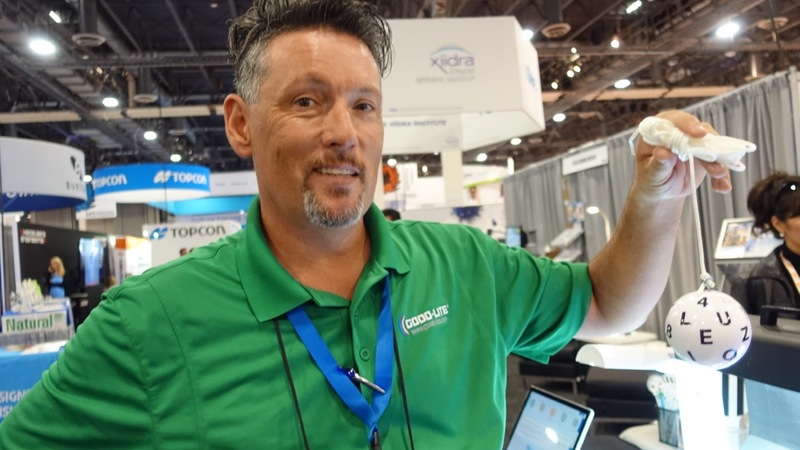 If I had taken anything home from Vision Expo, it would have been this guy. His glasses were from Pro Design Denmark.